Forecast models have been advertising the development of this system for days now. The structure of Jimena is rapidly organizing. 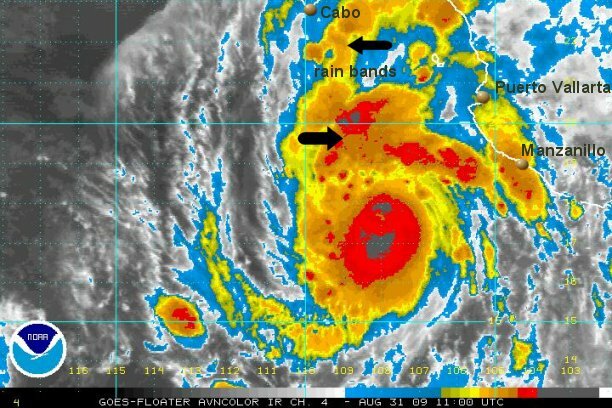 Deep convection is over the center of circuation and Jimena could become a hurricane in the next 24 hours. Some rain is on the coast, although the worst of the weather is offshore. 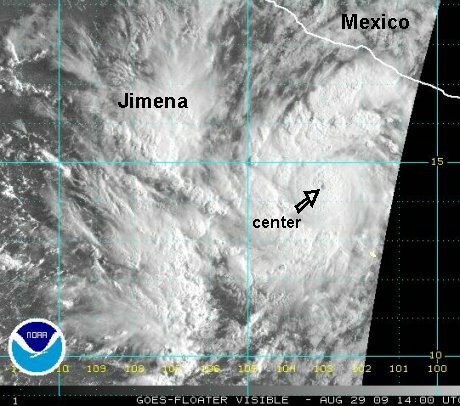 As of 8:00 am edt / 5:00 am pdt tropical storm Jimena was centered near 14.3° N / 102.7° or about 415 miles south southeast of Manzanillo, Mexcio. Top sustained winds are estimated at 50 mph (NHC 40 mph). It is moving west northwest at about 12 mph. Forecast models keep Jimena west of the coast as it gradually turns northwest over the next three to four days. Interests on the west coast of Mexcio including the Baja should follow the progress of Jimena. Jimena will likely become a major hurricane as the intensification process continues. As of 11:00 am edt / 8:00 am pdt hurricane Jimena was centered near 14.3° N / 103.2° or about 345 miles south southeast of Manzanillo, Mexcio / 735 south southeast of Cabo San Lucas, Mexico. Top sustained winds are estimated at 80 mph (NHC 80 mph). It is moving west northwest at about 12 mph. Jimena is still developing rapidly and it appears to be closing in on cat 3 status. It has an extremely small eye. The worst of the conditions remain offshore. 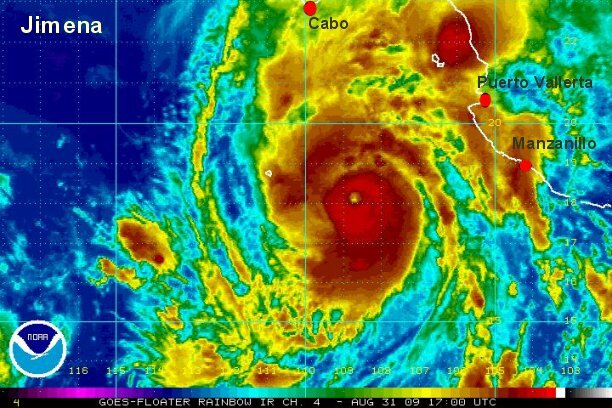 As of 5:00 pm edt / 2:00 pm pdt hurricane Jimena was centered near 15.1° N / 104.2° or about 270 miles south of Manzanillo, Mexcio / 655 southeast of Cabo San Lucas, Mexico. Top sustained winds are estimated at 110 mph (NHC 105 mph). It is moving west northwest at about 9 mph. The eye of Jimena is extremely small and cloud tops continue to cool in the eyewall. Some bands are near the coast of Manzanillo bringing locally heavy showers. The strongest winds remain well offshore. Seas are about 20' near the center. Further strengthening is likely before Jimena encounters cooler water to the north in a day or two. Jimena is a dangerous hurricane! It may be in the vicinity of Cabo San Lucas by Monday night. 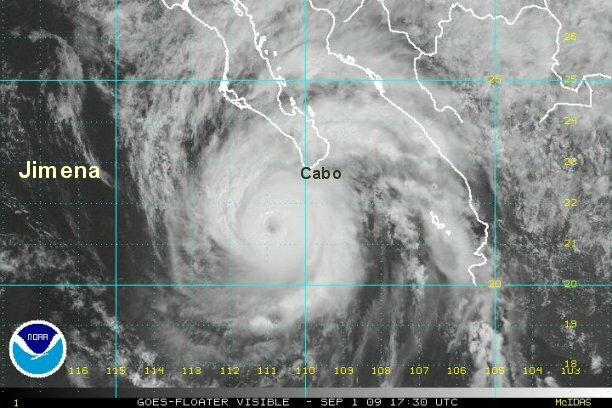 As of 8:00 am edt / 5:00 am pdt hurricane Jimena was centered near 16.2° N / 106.0° or about 525 south southeast of Cabo San Lucas, Mexico. Top sustained winds are estimated at 125 mph (NHC 115 mph). It is moving northwest at about 12 mph. Forecast models have shifted eastward. Interests on southern Baja should follow the progress of Jimena closely. 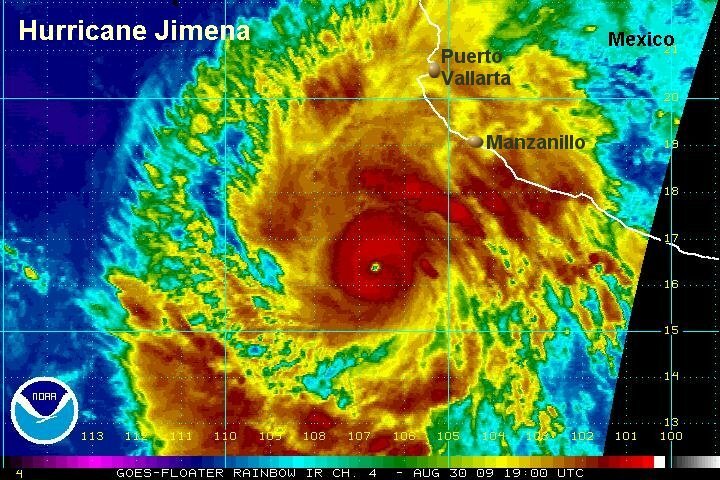 Jimena continues its rapid deepening and not far from being classified as a cat 5 hurricane. At this strength, strengthening / weakening trends are controled by eyewall replacement cycles which are difficult to forecast. The strongest winds remain well offshore. Seas are about 30' near the center. 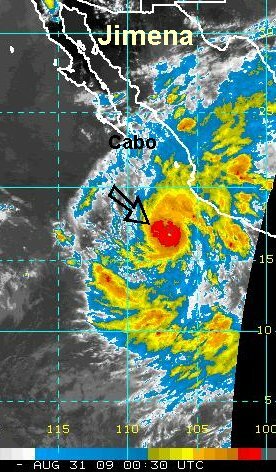 As of 3:00 pm edt / 12:00 pm pdt hurricane Jimena was centered near 16.1° N / 105.9° or about 490 south southeast of Cabo San Lucas, Mexico. Top sustained winds are estimated at 145 mph (NHC 135 mph). It is moving northwest at about 8 mph. Interests on southern Baja , including Cabo San Lucas should follow the progress of Jimena closely. Jimena has finally stabilized. It is still a solid category four hurricane. At this strength, strengthening / weakening trends are controled by eyewall replacement cycles which are difficult to forecast. The strongest winds remain well offshore. Seas are about 28' near the center. Jimena is a dangerous hurricane! It may be in the vicinity of Cabo San Lucas by Monday night. As of 9:00 pm edt / 6:00 pm pdt hurricane Jimena was centered near 17.0° N / 107.2° or about 440 miles south southeast of Cabo San Lucas, Mexico. Top sustained winds are estimated at 140 mph (NHC 140 mph). It is moving northwest at about 8 mph. It appears that an eye replacement cycle has begun and that the eye is considerably larger. Seas are about 30' near the center. Jimena is a dangerous hurricane! It will be in the vicinity of Cabo San Lucas by Tuesday morning. Some heavy rain bands are now just south of Cabo San Lucas and also affecting the west coast near Manzanillo. Rough swell is already battering the west coast of Mexico. As of 8:00 am edt / 5:00 am pdt hurricane Jimena was centered near 17.7° N / 108.2° or about 370 south southeast of Cabo San Lucas, Mexico. Top sustained winds are estimated at 125 mph (NHC 145 mph). We are considerably lower than NHC with the recent eyewall replacement cycle. Jimena is moving northwest at about 8 mph. 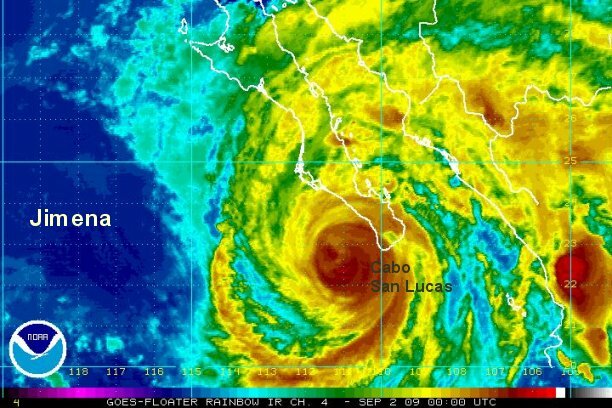 Interests on southern Baja , including Cabo San Lucas should follow the progress of Jimeana and start hurricane preparedness. The eyewall replacement cycle is over and the eye has become very discernable again over the past few hours. A recon just finished reporting and found a 130 mph surface wind with a maximum flight level wind of about 155 mph. Keep in mind that winds aloft several thousand feet are stronger than at ground level. Jimena is a dangerous hurricane! It will be in the vicinity of Cabo San Lucas by Tuesday morning. Some heavy rain bands are now just south of Cabo San Lucas and also affecting the west coast near Manzanillo. Rough swell is already battering the west coast of Mexico with swell 12-15'. Seas up to 32' are offshore near the center of Jimena. 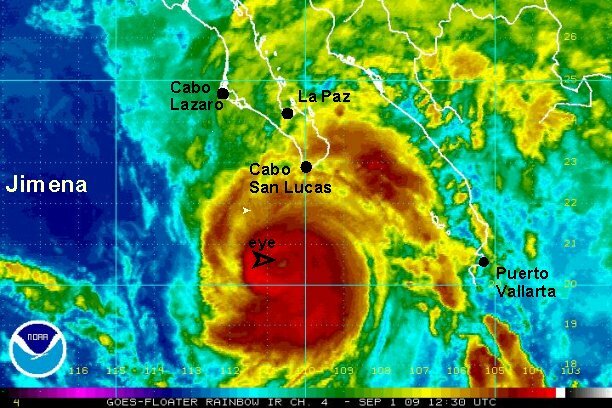 As of 2:00 pm edt / 11:00 am pdt hurricane Jimena was centered near 18.2° N / 108.8° or about 325 south southeast of Cabo San Lucas, Mexico. Top sustained winds are estimated at 135 mph and increasing (NHC 145 mph earlier advisory). We are going close to the recon report for winds. 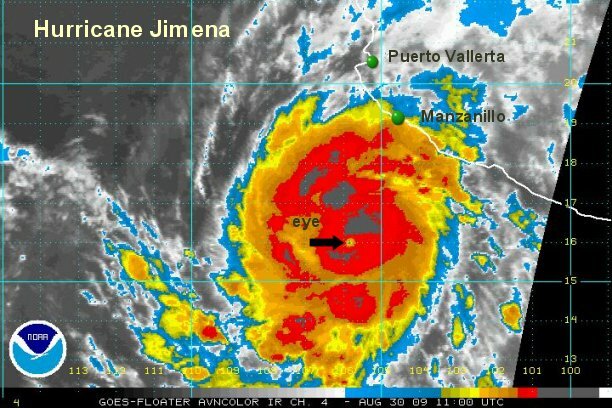 Jimena is moving northwest at about 8 mph. Pressure of 936 mb. Forecasts call for Jimena to make landfall on the southwestern Baja coast Tuesday night or early Wednesday morning. A recon from earlier today measured a surface wind of 145 mph and flight level wind of 170 mph. We agree with NHC's assessment of this bordering on a cat 5 hurricane. The eyewall has expanded and eye looks a little smaller, all signs of strengthening. Jimena is a dangerous hurricane! It will be in the vicinity of Cabo San Lucas by Tuesday midday. Some heavy rain bands are now just south of Cabo San Lucas and also affecting the west coast north of Puerto Vallarta. Rough swell is already battering the west coast of Mexico and southern Baja with swell 12-15'. Seas up to 43' are offshore near the center of Jimena. 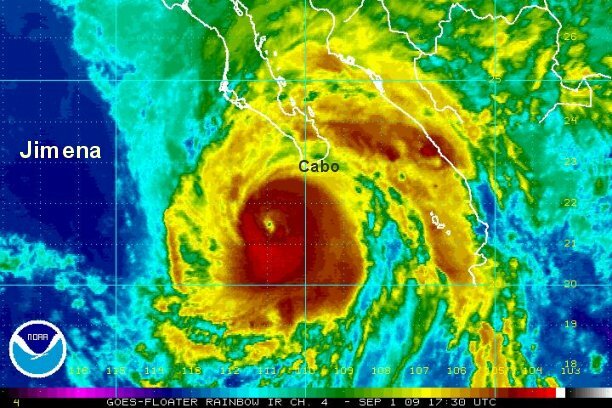 As of 9:00 pm edt / 6:00 pm pdt hurricane Jimena was centered near 19.0° N / 109.4° or about 265 south of Cabo San Lucas, Mexico. Top sustained winds are estimated at 155 mph (NHC 155 mph earlier advisory). Jimena is moving northwest at about 10 mph. Pressure of 931 mb. Interests on southern Baja , including Cabo San Lucas should follow the progress of Jimeana and finish hurricane preparedness by tomorrow morning. Forecasts call for Jimena to make landfall on the southwestern Baja coast Tuesday night or early Wednesday morning. Any slight change of course to the east will cause landfall to be several hours earlier! Flooding rains, storm surge and battering waves will accompany Jimena. We believe that Jimena is starting to weaken some as it moves slowly over cooler water. Clouds tops over the central dense overcast are warming some, indicating this slow weakening. It still remains a very dangerous hurricane though. A recon will be investigating by late morning (pdt). Jimena is a dangerous hurricane! The winds associated with the center of the hurricane will start increasing during the next several hours over the southern Baja. Rough swell is battering the west coast of Mexico and southern Baja with swell 12-15'. Seas up to 42' are offshore near the center of Jimena. As of 8:00 am edt / 5:00 am pdt hurricane Jimena was centered near 20.6° N / 110.4° or about 155 miles south of Cabo San Lucas, Mexico / 315 miles south southeast of Cabo Lazaro, Mexico. Top sustained winds are estimated at 145 mph (NHC 155 mph earlier advisory). Jimena is moving north northwest at about 12 mph. Earlier pressure of 931 mb. Interests on southern Baja , including Cabo San Lucas should follow the progress of Jimena and finish hurricane preparedness immediately. Forecasts call for Jimena to make landfall on the southwestern Baja coast tonight or early Wednesday morning. Any slight change of course to the east will cause landfall to be several hours earlier! Flooding rains, storm surge and battering waves will accompany Jimena. NHC just dropped their winds on the 8 am pdt advisory to match our earlier estimate of 145 mph. Pressure from the recon up to 945 mb. Jimena continues a slow methodical weakening trend as it approaches cooler water. 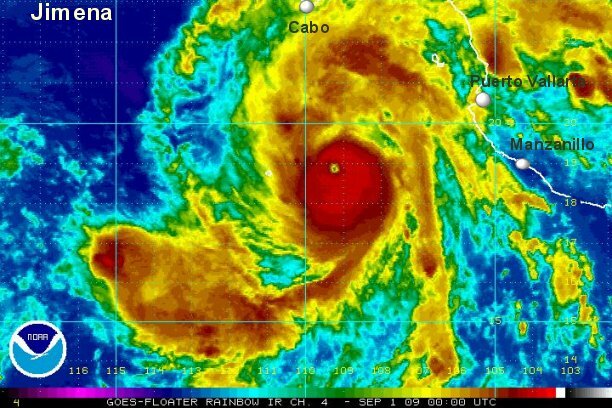 As of 3:00 pm edt / 12:00 pm pdt hurricane Jimena was centered near 21.5 N / 111.0° or about 110 miles southwest of Cabo San Lucas, Mexico . Top sustained winds are estimated at 125 mph (NHC 135 mph earlier advisory). 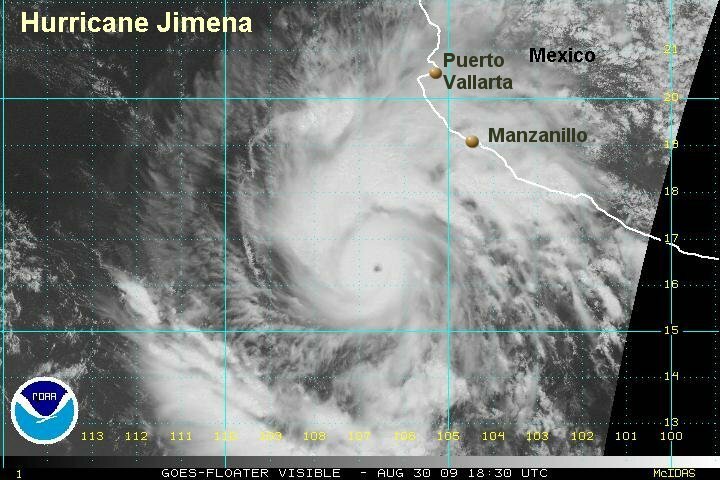 Jimena is moving north at about 12 mph. Earlier pressure of 948 mb. Jimena continues a slow methodical weakening trend as it approaches cooler water. It will likely make landfall as a strong category 2 or weak category 3 hurricane. 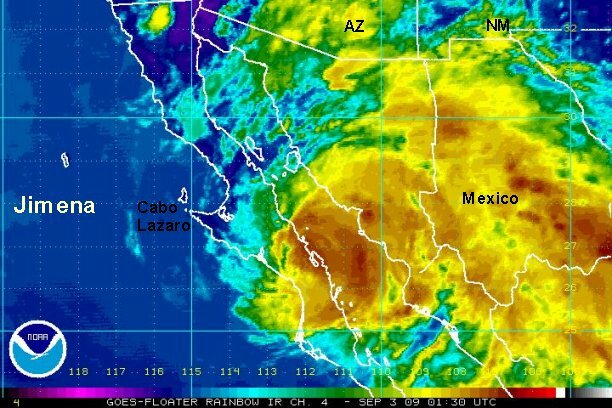 Heavy rain and strong winds will increase rapidly on the southwest coast of the Baja. 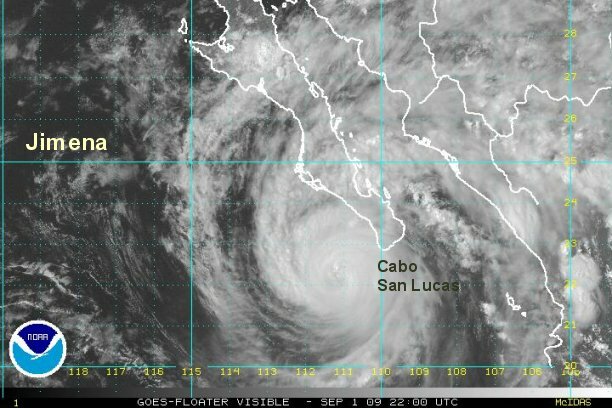 Landfall will be half way between Cabo San Lucas and Cabo Lazaro. Rough swell is battering the southwest and south coast of Baja swell 12-15'. Seas up to 38' are offshore near the center of Jimena. 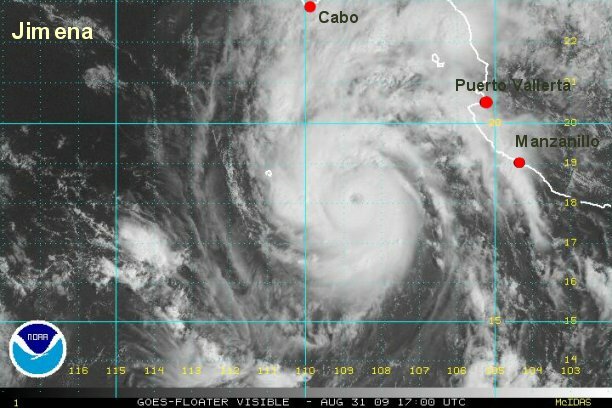 As of 10:00 pm edt / 7:00 pm pdt hurricane Jimena was centered near 22.8 N / 111.2° or about 75 miles west of Cabo San Lucas, Mexico . Top sustained winds are estimated at 115 mph (NHC 120 mph). Jimena is moving north at about 12 mph. Pressure of 951 mb. Hurricane Jimena has made landfall over the Baja. Winds will rapidly decrease over the next several hours. Flash flooding will be the main concern (now and) later today as winds weaken. 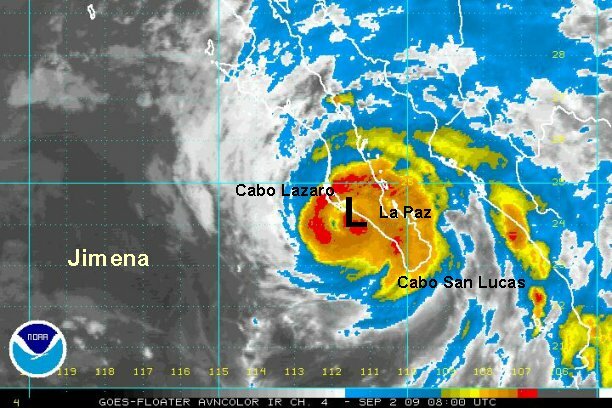 As of 8:00 am edt / 5:00 am pdt hurricane Jimena was over the coast of Baja Mexico southeast of Cabo Lazaro. Top sustained winds are estimated at 90 mph (NHC 105 mph earlier advisory). Jimena is moving north northwest at about 13 mph. Jimena remains over land and continues to be a flash flooding threat. Heavy rain is over the central Baja and has spread into the northwestern part of mainland Mexico. As of 10:00 pm edt / 7:00 pm pdt hurricane Jimena was over the west coast of the Gulf of California near Rosarito. Top sustained winds are estimated at 60 mph (NHC 80 mph on an earlier advisory). Jimena is nearly stationary or drifting northward.